Compatibility: Work with Android 4.4 or higher, iOS 7.0 or higher smartphones. 1. Phone Function: Support micro SIM card, can be used for phone call, message, hands-free Bluetooth call, sync contacts, call reminder, call records. 2.Bluetooth Device: Connect to smart phones, Bluetooth speakers and Bluetooth earphones , be used to receive notifications, make phone calls, play musics, etc. 3.Anti-lost, Remote Camera, Notification Sync (only for Android smartphones). 4. Others: Camera, Sound Recorder, Music Player, Alarm Clock, Calendar, Pedometer, Sleep Monitor, Sedentary Reminder, Facebook, Twitter, WhatsApp,Browser, Calculator, etc. 3. Find your phone and click 'Pair' on the watch, after that you can find the watch on your phone. 2. For iOS smartphone besides Notification Sync, Remote Camera, Anti-lost, BT massage are unavailable，all the other features are available. 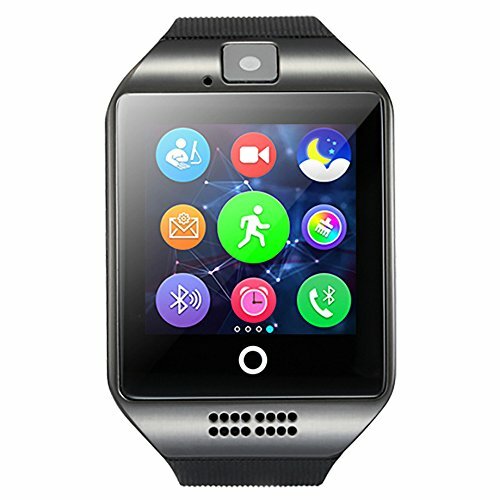 Multi-function: Phone call, message, music player, camera, voice recorder, calender, alarm clock,remote capture, anti-lost, SMSand SNS notification sync, browser, Facebook, WhatsApp, Twitter etc. Dual Work Patterns: Bluetooth pattern and SIM pattern, in SIM pattern you can use it as a stand-alone phone (only support GSM 850/900/1800/1900 MHz micro SIM card). Wearing More Comfortable:Stainless steel surface, Precision laminating process, Nano TPU85 material strap, anti-sweat matte surface treatment, ergonomic convex design and soft strap which make wearing more comfortable. Life Waterproof, for example, the smart watch surface can resist rainwater. Large Capacity Battery: Built in 500 mAh battery, with low power consumption Bluetooth chip and sensor, charging time about 2 hours and using time about 2 days (varies with use). Health Tracking:Pedometer, Sleep Monitor, Sedentary Reminder, record all-day activities, help improving sleep quality, keep balance between work and life. If your wrist circumferencet is less than 6.8 inches, the watch will be bigger for you. If you have any questions about this product by beaulyn, contact us by completing and submitting the form below. If you are looking for a specif part number, please include it with your message.